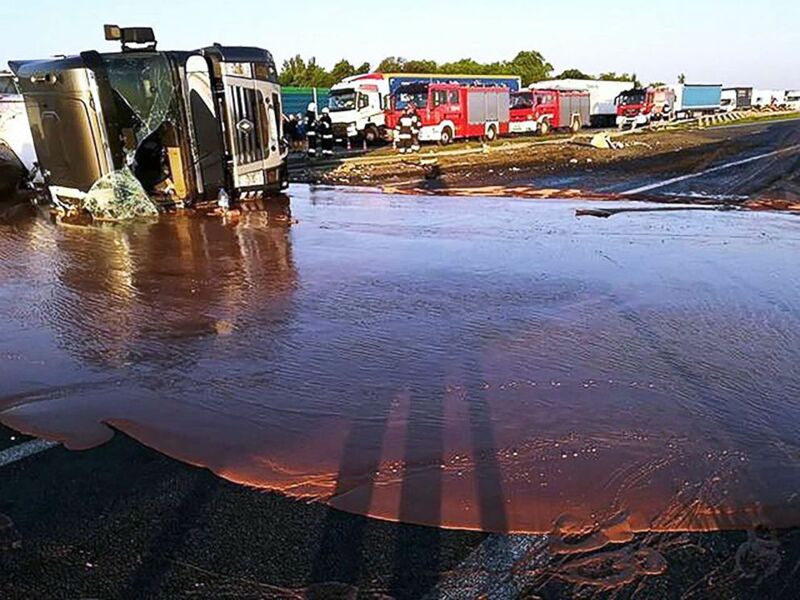 Emergency crews in western Poland had a sticky mess on their hands after a truck full of liquid chocolate overturned Wednesday morning. This video grab taken from Polish private TVN channel shows hot chocolate poured out over the A2 highway between Wrzesnia and Slupca near Poznan, western Poland, on May 9, 2018. 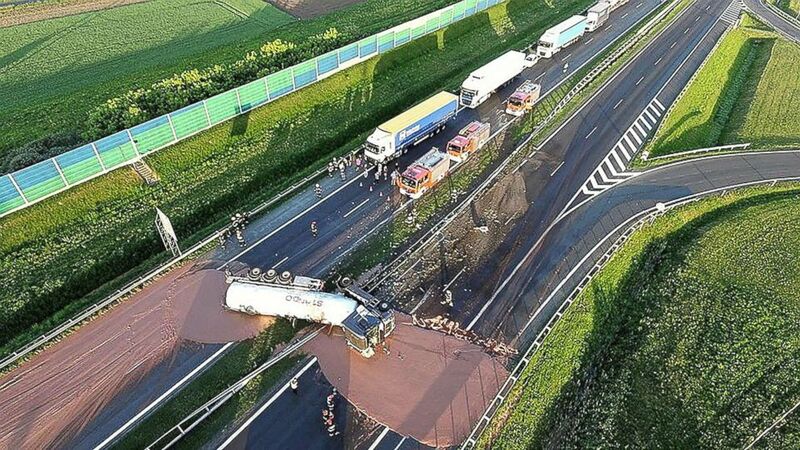 A tractor-trailer spilled tons of liquid chocolate after it crashed into a barrier on a highway near Poznan, according to local broadcaster TVN24. The truck's driver was transported to the hospital with a broken arm, the station reported. 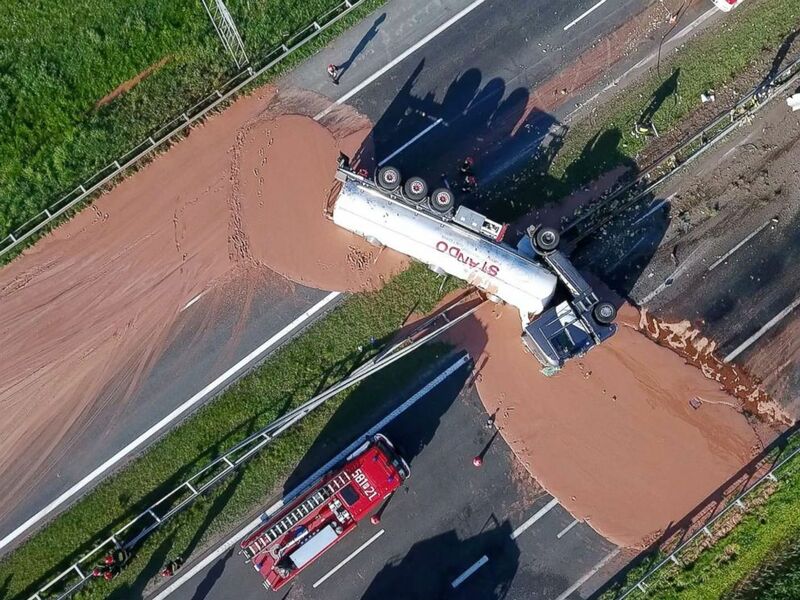 Tons of liquid milk chocolate is spilled on a highway after a truck transporting it overturned near Slupca, in western Poland, May 9, 2018. Both sides of the divided highway were covered with the sweet stuff following the crash, and passing vehicles left chocolate-covered tire marks for over a mile before authorities closed down the highway. The liquid chocolate solidified as it cooled, making for a sticky mess, according to TVN24, and rescue workers will have to blast the road with hot water to clean it up. This aerial photo captures a tractor-trailer that overturned on a Polish highway in central Poland on May 09, 2018. The spill also caused a traffic jam, blocking travel in both directions as emergency crews worked to re-route drivers through neighboring roads. 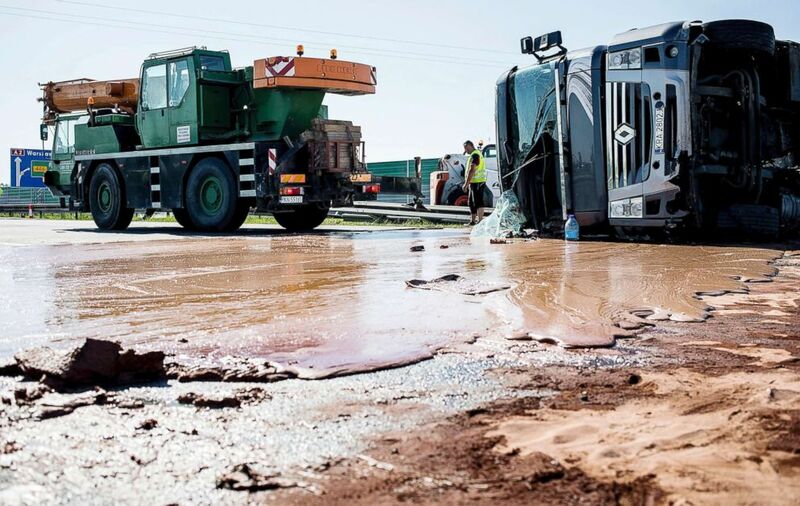 A tractor-trailer lies in liquid chocolate after overturning on a Polish highway in Poland, May 09, 2018.